How eco-friendly is your Christmas tree? ‘Tis the Season to spread love and cheer… and sustainability? It’s the annual Christmas dilemma. No, we aren't talking about what is appropriate to buy your work secret Santa or if you should bother making bread sauce again this year (the answer to that by the way is yes, always). We are talking about whether it’s better to buy a real or artificial Christmas tree. This year we are going real. Given that we are so fanatical about our bags for life, metal straws and reusable cups, we feel our vow to live more sustainably has to extend to plastic fake trees that are shipped miles across the globe. It's true that fake plastic trees last for years – and nowadays they can look very realistic. But they do take enormous amounts of energy to manufacture and when they get too disheveled to last another season, it’s just more synthetic waste to be disposed of. 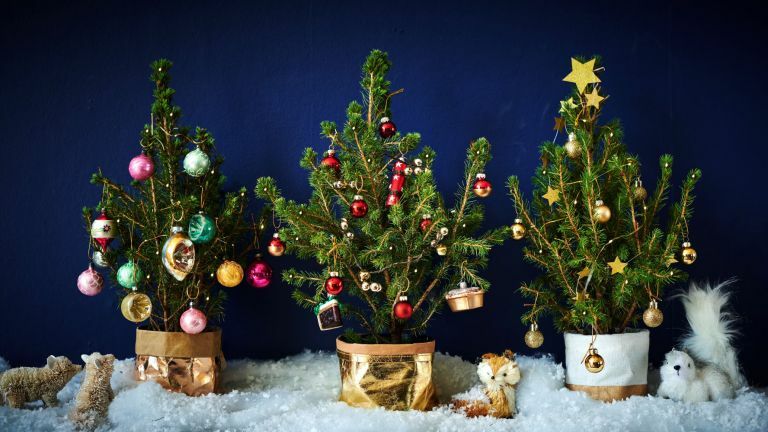 Yes, we know we have the 10 best artificial trees on this very website (pot, kettle, black), but lots of you are still clamouring them. But hey, we don’t seem to be the only ones who are thinking about how to be greener this festive season. A study commissioned by Bloom & Wild, has found that 59 per cent of people in the UK now consider the environment a deciding factor when it comes to purchasing Christmas trees and decorations. According to The Carbon Trust, a real Christmas tree has a significantly lower carbon footprint than an artificial tree, especially if it is disposed of properly, by chipping or burning. Artificial trees are not recyclable, and most will end up clogging landfills for years to come, having a detrimental impact on the environment. If you want to be reassured that your real tree has been grown sustainably, look out for the FSC-certification  logo. Or you could go one step further and grow your own – buying a potted tree with roots lets you grow it outside and use it again next year, reducing its environmental impact and costing you less. From the same Bloom & Wild survey, 18 per cent of people said they have re-planted their trees in the past and a huge 49 per cent of people surveyed have said they would buy a smaller real tree that they could then plant to reduce the carbon footprint. Having a more sustainable Christmas doesn't just involve picking the right tree, there's loads you can do to ease off rampant consumerism a bit and think about the planet. Go and check out our tips for a more eco-friendly Christmas for some inspiring ideas.